There were firsts and departures from the norm during the Swearing-in and Welcome ceremony that was held on Tuesday 22 August to formally and officially commence the tenure of His Excellency Augustus Jaspert as the new Governor of the Territory. One departure was the fact that after a long tradition of the ceremony being held in the House of Assembly Chambers, the new Governor was sworn-in at a ceremony that was held at the Supreme Court. Another noted departure was the absence of a few members of Government. It was observed that only the Premier Dr. the Hon. D. Orlando Smith, Deputy Premier Dr. the Hon. Kedrick Pickering, and Minister for Communications and Works Hon. Mark Vanterpool were present for Ministers. While only Ninth District Representative, Dr. the Hon. Hubert O’Neal was present for the Government backbenchers. For the first time, a Governor’s Swearing-in ceremony featured children as specially invited guests and Deputy Governor, Mrs. Rosalie Adams explained that the new change was made for two reasons. “Cognizant of the younger members of the Jaspert family, and the need for our youth to be begin to appreciate the work of Government at various levels, for the first time in our history, children and young people have been invited to participate in a Swearing in Ceremony of the Governor. Let it be clear Governor, that you and your entire family are welcomed into our community and are supported by us all,” Mrs. Adams announced. Newly appointed Governor of the British Virgin Islands His Excellency Augustus James Ulysses Jaspert said that he plans to make his presence felt and will be keeping his ear open as he interacts with the people of the Territory. “I will serve with integrity, fairness and impartiality. I want to be approachable and (be) part of the community and will listen to all views and want to support the institutions of these islands to own and tackle any challenges,” the new Governor announced. Mr. Jaspert said that he will be taking his role as Governor very serious and will have no reservation about making decisions in the interest good governance. “I will be engaged, but will not shy away from acting where the values of fairness, security and good governance are not at the highest standards. As a people of such talent and strengths, these islands should rightly expect the highest standards,” he said. Her Majesty’s Representative said that he intends to serve in a partnership – with the elected government, the public service, the United Kingdom, the faith, and civil and public organizations. “My commitment as Governor is to serve and to work in partnership to make the Virgin Islands an even better place, an even more prosperous, safe, and well governed place, a place that is valued for the important part it plays internationally and a place that creates even greater potential for its future, in particular through its young people as the future generation,” he added. Premier Dr. The Hon. D. Orlando Smith mentioned that the Queen’s Representative toured the Territory on 21 August, the day of his arrival and he hopes what was seen on the tour demonstrates the resilience of the Territory and the effectiveness of Government’s efforts. Hon Smith told the Governor that he arrives in the peak of the hurricane season and that more bad weather has been predicted. The BVI Leader stated that he looks forward to working with the Governor in their respective capacities to keep the Territory in a high state of preparedness for the remainder of the hurricane season. The Premier alluded to the UK’s offer of assistance via the ship RFA Mounts Bay and stated that he anticipates further discussions on future support efforts with the Governor: “Your Excellency I also wish to thank Her Majesty’s government for the offer of support and look forward to discussing with you how the United Kingdom can best assist the Territory moving forward. We are in the process of completing a damage assessment to ascertain the full extent of the damage caused by the wave, the value of losses, and the extent of support that will be needed in the near and long term to fully rehabilitate the Territory,” Hon. Smith added. In his welcome remarks at the Swear-in ceremony the Leader of the Opposition – explained that his office is guided by the Virgin Islands Constitution Order 2007, The Standing Orders, The Public Finance Management Act and Regulations and The Protocols for Effective Financial Management. Hon. Andrew Fahie pointed out that in adhering to the tenets of the Protocols much has been said about him. He further announced that his advocacy for good governance caused persons to accuse him of working with the previous Governor. “Consistently over the past five years and more so since the signing of the protocol document, I have sounded over and over the principle themes of Adherence to the Laws of the Virgin Islands; Accountability; Transparency and Good Governance. I have sounded these principle themes so often that there are those who for their own smoke-screen have announced that I was favoured by your predecessor and was working hand in glove with him,” Hon. Fahie said. However, the Leader of the Opposition said that he will not be deterred from doing his work. Mr. Fahie said that he will not be embroiled in unnecessary battles. “I will offer no unwarranted battles and surely no squabbles concerning venues for signing ceremonies. There are far more pressing issues and matters of urgency that are critical to the well-being of the people of the Virgin Islands and to their political advancement. On most issues, we will agree but there are some that require intense discussions. However, I can assure you that this will be done in a forthright and respectful manner,” Hon. Fahie added. The Governor is the representative of Her Majesty The Queen in a British Overseas Territory. The Governor acts as the de facto head of state and is usually responsible for appointing the head of government, and senior political positions in the territory. The Governor is also responsible for liaising with the UK Government, and carrying out any ceremonial duties. Mr Augustus Jaspert took office as Her Majesty’s Governor to the Virgin Islands on 22 August 2017. 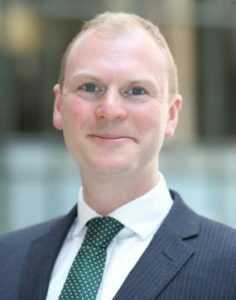 He joins the Virgin Islands having recently served in the United Kingdom’s Cabinet Office leading on matters relating to national security and intelligence and also served in the office of Prime Minister Cameron in Downing Street as the Private Secretary on Home Affairs issues such as policing, justice, immigration, security and Northern Ireland. Mr Jaspert’s previous career has been spent in varied roles in different aspects of public services, throughout all of which he has focussed on improving services to deliver better outcomes for citizens. After a brief attachment in Ghana, he started his career in local government in Surrey, a County Council in the south of England, with roles that included supporting vulnerable children and those who needed extra support through learning or physical disabilities. He also had short roles involving emergency planning and response. Mr Jaspert joined central government in the UK in 2007 as part of a team tackling social exclusion where he designed new approaches for how different services can best work together to improve services for families in need and support some of the poorest members of society. He also worked on systems to improve the performance of key public services such as the police, prisons and the courts in the Prime Minister’s Delivery Unit. Ensuring safety and security for people became an increasing theme for Mr Jaspert’s career as he moved in to the UK Home Office as a Deputy Director leading local policing and improving the public’s confidence in the police, and the Government’s strategies to reduce the harm from the misuse of alcohol and illegal drugs from 2007-2009. During this time he also served as a Magistrate in a criminal court in South West London. Mr Jaspert went to his local school in London prior to studying History and German at the University of Edinburgh, including some time in Vienna, Austria. Whilst working in local government he completed a Postgraduate Diploma in Management Studies at the University of Kingston. He later became a Member of the Royal College of Defence Studies and completed a second Master’s degree in international strategy and security at Kings College London in 2014. Mr Jaspert was born in London, but lately has lived in West Sussex, a rural county in the South of England. His wife Millie, who is originally from Scotland and a primary school teacher, and his two sons aged nine and five years old are also in the BVI.